“Good morning; my thanks to Premier Wynne for the opportunity to once again meet and discuss the city-building priorities of Mississauga. “We had a productive meeting on a number of topics, in particular transit, infrastructure and housing. 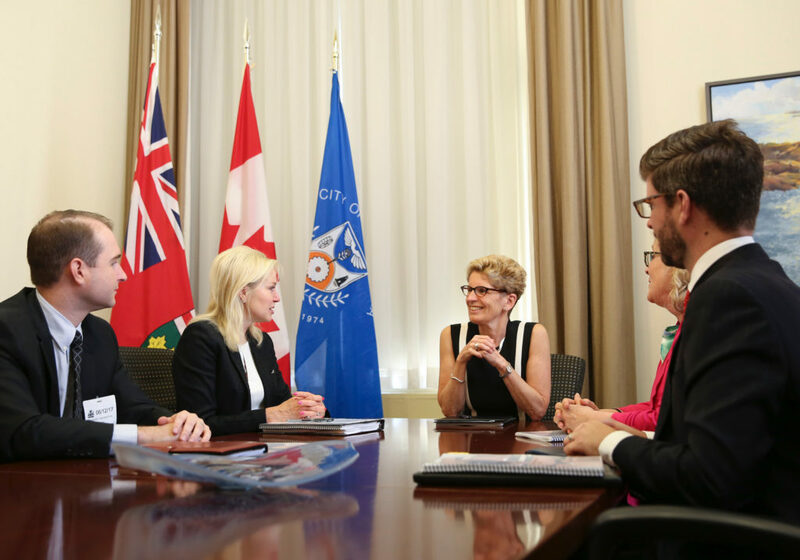 “Let me update you about how this partnership is delivering results for Ontario’s third-largest city. “Mississauga and Metrolinx are moving ahead with construction of the Hurontario Light Rail Transit. “The Hurontario LRT is a 20 kilometer – 22 stop – regionally-integrated transit project. “It’s a $1.4 billion dollar investment fully funded by the province. “Over the next two decades, Peel Region will need to accommodate over 300,000 people and approximately 150,000 jobs. “Nearly a quarter of this growth is expected to live in the area immediately surrounding the Hurontario corridor. “We are planning new and important intensified developments, consistent with the planning and growth requirements that have been decided in collaboration between mayors and the province. “But these developments would not be possible without full funding for the LRT. “We are very encouraged the provincial government is doubling gas tax funding to municipalities. “Council and staff will budget for this increased funding to break gridlock, build transit and move people and our economy forward. “In Mississauga, we know that transit policy is economic development policy. “As is investing in infrastructure, which is why the Premier and I discussed her government’s commitments and the federal government’s newly announced $81 billion in Phase 2 infrastructure spending and how to ensure it is delivered in Mississauga and across Ontario where it is needed the most. “The Premier and I also discussed how Mississauga is doings its part to give people more options for affordable housing with our new action plan: Making Room for the Middle: A Housing Strategy for Mississauga. “We also discussed the need for increased investments in our subsidized housing to tackle the Region of Peel’s wait list of over 12,500 people. “Finally, I was pleased to discuss the announcement last week by Minister Sousa of the sale of 177 acres of prime waterfront land in Mississauga’s Lakeview neighbourhood; 67 acres have been allocated to the City of Mississauga as part of our plans for a new, mixed-use waterfront community. “Lakeview’s promising future has always been a leading priority in our pre-budget submissions. “This announcement is further proof that Mississauga is at the top of the provincial government’s agenda.